Something’s cooking in Uzbekistan, and it’s not just plov. The country’s political stability is on the line, as a power struggle is underway for control in a post-Karimov reality that is soon approaching. Karimov himself has been increasingly sidelined as of late, even being pressured to allow his own daughter, once thought to be his hand-picked successor, to go under house arrest. The rival security agencies, specifically the National Security Service, are now the ones holding the initiative, and the Karimov family will likely be a political irrelevancy after the President’s passing. Aside from the successionist intrigue, the whispers of Karakalpakstan independence (likely Western-influenced) and the reemergence of the Islamic Movement of Uzbekistan (IMU) bode negatively for the country’s internal stability. Thus, the bubbling pot of destabilization is set to overflow any time now, and the intended disastrous consequences are expected to reach as far away as Moscow and Beijing. Uzbekistan is geostrategic for a few reasons, not least of all for the fact that it abuts all four other Central Asian republics and Afghanistan. Additionally, Uzbekistan has the largest population and military of all the former Soviet republics in Central Asia. This means that not only do events there have the strong possibility of affecting all of its neighbors, but conversely, regional events can play a large role in its own domestic affairs. Looking even deeper into this, one sees that most of the fertile and densely populated Fergana Valley, the heart of Central Asia, is located within Uzbek territory, further underlining the central placement of Uzbekistan in regional developments. In an out of regional context, Uzbekistan retains major importance for Russia, China, and the West. Pertaining to Moscow, it sees Tashkent as a regional holdout to its Eurasian Union integrationalist plans, as well as a defector from the CSTO. Uzbekistan is also in a heated rivalry with CSTO-member Tajikistan, in which Russia could possibly be involved if the conflict goes hot. On the other hand, China has only positive relations with Uzbekistan, since the critical China-Central Asia Natural Gas Pipeline traverses the entire territory of this SCO member. As for the West, although the US had its military kicked out of the country in 2005 after criticizing the Andijan Events and the EU imposed sanctions around that time, bilateral relations appear to be on the mend. The US and NATO have considered selling Uzbekistan their used Afghan equipment, and the EU reversed its previous arms embargo. Thus, what one is left with is that Uzbekistan is antagonistic to Russia and its integrationalist vision, friendly with China in terms of energy and political dealings, and potentially becoming a bastion of Western influence (or strategic destabilization) after the NATO drawdown later this year. Unquestionably, the country is the core of all three actors’ Central Asian policies and exceedingly more relevant to each of them as time goes by. Going back to Uzbekistan’s oncoming destabilization, the country is presently experiencing the climax of a long-running power struggle between the National Security Service and the Interior Ministry before next year’s presidential election. Seeing as how Gulnara Karimova has been removed from political life (possibly by Rustam Inoyatov from the National Security Service, whom she accuses), now may be the time for Inoyatov to make his power play. At the same time, however, Stratfor feels that whoever succeeds Karimov, be it through an election or a coup, must be a potent enough to manage relations between Uzbekistan’s disparate and conniving clans. Their January 2014 analysis states that the Tashkent Clan, of which Inoyatov is a part of, is on the upswing, having just mitigated the Samarkand-heavy Interior Ministry through a recent reshuffling. However, the National Security Service underwent a purge of its own in July, raising questions over how much power they truly hold. Furthermore, a Carnegie Center report from July believes that Karimov will bestow the final say over whoever replaces him, making the leadership transition even more confusing for observers. Who will succeed the first President of Uzbekistan (in office since 1991)? What is obviously happening is that multisided power plays are under way in Tashkent, with various factions and clans vying for power. It is unclear who Karimov would prefer to succeed him, but the fact that his daughter was implicated in a corruption scandal and currently under house arrest, points to the fact that he doesn’t wield as much power as once thought. Either that, or he is under the influence of Inoyatov, which in both cases goes to show that Karimov’s power is rapidly fading even while he nominally remains president. The clan factor, too, cannot be discounted, and ‘dark horses’ may emerge to steal the spotlight or team up against Inoyatov in the future. 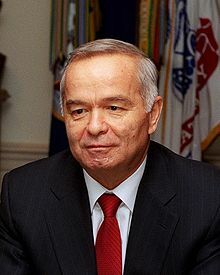 All in all, Uzbekistan’s secessionist question is messy and convoluted, and there is no certainty over who will replace Karimov if he dies, steps down, refuses to run in the upcoming election, or is overthrown, or even which of these scenarios will transpire in the near future. Under such uncertain circumstances, the specter of Color Revolution may even once again rear its head. There has been muted talk lately of the beginnings of a Karakalpak secessionist movement in Uzbekistan’s western autonomous republic. Hushed Twitter talk and mysterious fliers have started promoting this idea in the distant and sparsely populated western chunk of the country, although it has been in the works for about for a few years already. It must be noted that sizeable natural gas reserves are located here (especially under the former Aral Sea bed), although the nearby Bukhara and Xorazm Provinces have 70% of all resources. However, Karakapakstan is situated on Gazprom’s Central Asia-Center gas pipeline, meaning that it occupies strategic real estate in influencing Russia’s downstream shipments. Whether or not the population’s grievances are legitimate, what is important to consider is how this cause can be co-opted (if it isn’t completely created) by Western intelligence organizations to destabilize the region and maintain a source of pressure on the central government. An upsetting of the provincial dynamic into low- or large-scale rebellion and (to the degree that it is possible) insurgency could immediately spill over into Kazakhstan’s energy-rich western provinces or into Turkmenistan, both of which are underpopulated and whose borders the central government may have difficulties monitoring and controlling. If outside-sponsored destabilization cannot be successful in the populated Fergana Valley in the east, it may have a chance of succeeding in the polar opposite environment, the underpopulated Karakalpak deserts of the west. The Islamic Movement of Uzbekistan is a terrorist organization that has been actively fighting for an extreme Islamic state in Central Asia since the 1990s. It was almost completely wiped out by the US in the beginning of its Afghan Campaign, only to flee into Pakistan and reconstitute itself with foreign fighters. By this manner, it is a precursor to ISIL, in that it is fighting for a radical Islamic state in its home region by means of foreign jihadis. The group resurfaced in July when it carried out the deadly Karachi airport terrorist attack and demonstrated its grandiose terror plans and their effectiveness in practice. It declared its allegiance to ISIL earlier this month, thus raising the prospect that it may return to Central Asia after the NATO drawdown this year. Seeing as how it now gains its inspiration from its newfound partners in the Mideast, it may even chose to emulate their hybrid fighting style, implementing both conventional and unconventional methods in waging war. Should they use their alliance with the Pakistani Taliban to team up with their Afghan counterparts, this could see a Central Asian terrorist army sweeping into Turkmenistan (the ‘sitting duck’ of the region) and then flanking Uzbekistan from its exposed and scarcely protected western desert regions. The worst scenario would be if this occurs in the midst of an all-out successionist crisis in Tashkent, where the central government is near-paralyzed in responding to this threat and the terrorist hordes overrun large swaths of territory and capture key settlements. Through the fulfillment of any of these three primary destabilization scenarios or a combination thereof, the entire Central Asian region would experience a shatter effect that could bring about its total collapse. On the ground level, one of the first repercussions that may be massive refugee flows northwards into Kazakhstan. The parts of the Kazakh border in proximity to Uzbekistan are poorly guarded, thus meaning that the authorities may not be able to adequately and immediately react to a sudden and unexpected surge there. Since Kazakhstan is in the Eurasian Union, the freedom of movement within this zone could allow the refugees (or terrorists posing as such) to enter into Russia, thus expanding the problem even further. CSTO have to carefully look over the situation in the Central Asia. The breakdown in governance could then lead to Uzbekistan becoming a rapidly failing state, and hence, a perfect incubator for hyper terrorism on par with portions of the present Mideast. The terrorists could then target the vulnerable Chinese and Russian pipelines crisscrossing Uzbekistan, inflicting considerable economic (and consequently, social) damage to parts of those countries. Aside from attracting terrorist-prone elements such as misguided Chechens and revolutionary Uighurs, this terrorist cauldron could then spew its contents outwards to its neighbors or further afield to Russia and China. Should they cross into Kazakhstan, Kyrgyzstan, or Tajikistan, this would activate the CSTO’s mutual defense obligations and necessitate a Russian military response. Even prior to that, the SCO may attempt a type of intervention into Uzbekistan to prevent it from descending into complete disarray. No matter which way one looks, the chaotic potential energy circling around Uzbekistan could unleash itself in the near future and drag the entire area down with it. Uzbekistan is on the threshold of major changes, both inside and outside of the country. The successionist struggle is being fought largely behind the scenes for now, but ever more often, elements of this battle in Central Asia’s core state are coming to the surface. It is not known exactly which way the wind will blow in Tashkent, but what is for certain is that the process is wrapped in mystery and fraught with risk on all sides. While power plays are being made in the capital, in the distant energy-rich and geostrategic province of Karakalpakstan, mild secessionism is being stoked by unknown forces. Making matters worse, the IMU is back and its Taliban associates are more invigorated than ever, sparking fears of an ISIL-like blitzkrieg into Central Asia after this year. Although the situation facing Uzbekistan, its neighbors, and even Russia and China by extension, is horrendous, for the US’ grand strategic planners, this provides them with the opportunity to apply the combined lessons of Syria and Ukraine to yet another vulnerable theater and test the Reverse Brzezinski theorem of American hegemonic prolongation.